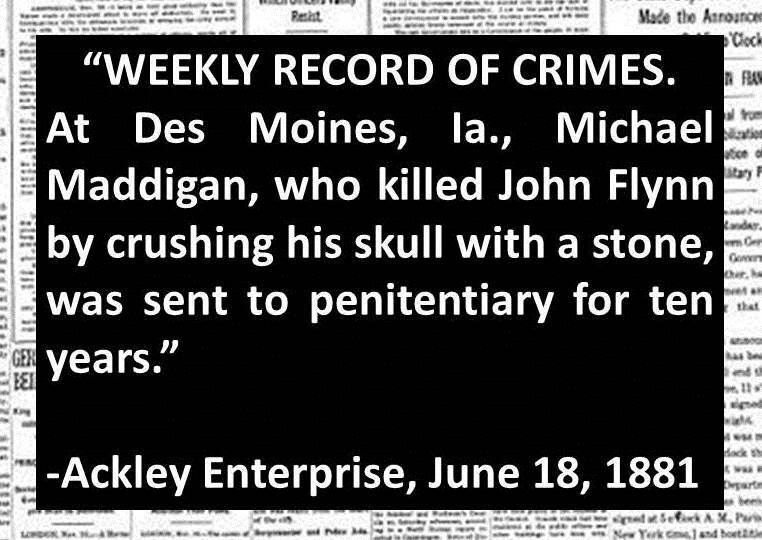 In late August, I learned the identity of a man who was convicted of murdering my third great-grandfather John Flynn in Des Moines, Iowa in 1881. 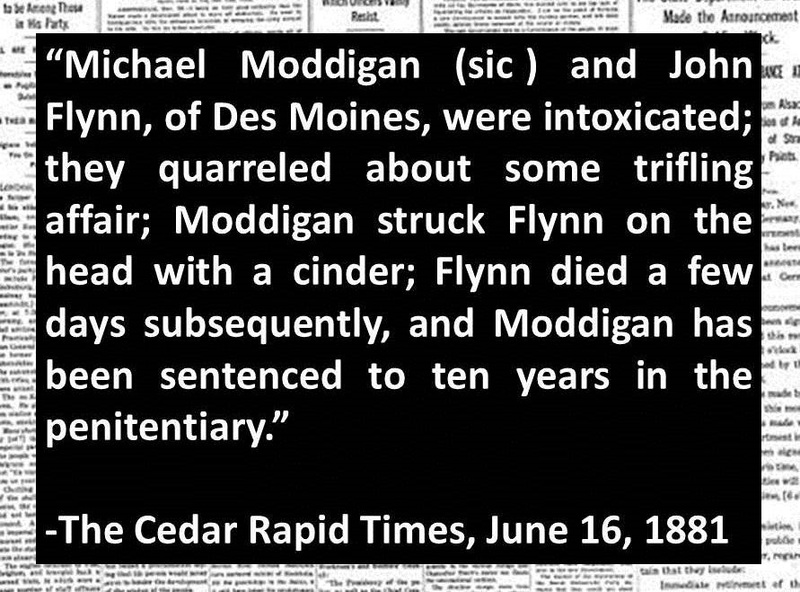 The newspaper reported that Michael Moddigan (sic.) was sentenced to ten years in the penitentiary. Unfortunately, the Clerk at the Polk County Courthouse in Des Moines was unable to find trial records to identify which penitentiary or even the circumstances of the fight. 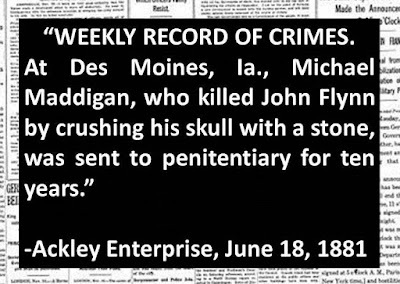 A second newspaper article dated two days later confirmed that Michael Maddigan was "sent to penitentiary for ten years." Ancestry has a collection titled, "Iowa, Consecutive Registers of Convicts, 1867-1970." It includes the "convict registers from three Iowa state penitentiaries: the Iowa State Penitentiary at Fort Madison, established in 1839; the Anamosa State Penitentiary in Anamosa; and the Iowa State Reformatory for Women in Rockwell City." I found no Michael Maddigan (or Moddigan) in the database. Did he serve his time elsewhere? I contacted Iowa's State Historical Library and Archives, where a research librarian confirmed that, "As for the Consecutive Registers, those would be the only penitentiaries in Iowa at the time." Why was Michael Maddigan not among the penitentiary registers? The newspapers said he was sent to prison. He should be there. During a recent trip to the Family History Library in Salt Lake City, I came across an Iowa death record dated November 8, 1882 - less than two years following the June 1881 sentencing. Michael Maddigan, born in Ireland, died aged 44 years at 2:00 am. He was a 34-year resident of Des Moines, who succumbed to his 18-month battle with consumption. It seems he was afflicted with tuberculosis. The death certificate also provided his place of death. Michael Maddigan passed away at 316 W. 5th Street in Des Moines. 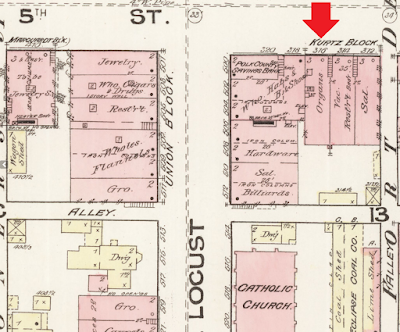 According to an 1884 Sanborn Fire Map of Des Moines, this was the address of an organ shop. Did he live in a residence on an upper floor? 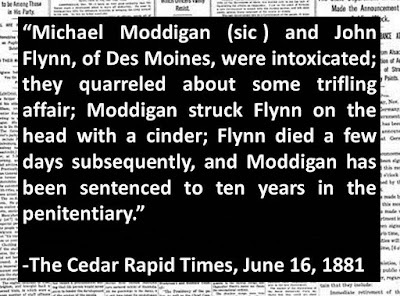 Regardless, it's clear that Michael Maddigan did not die in a state penitentiary fewer than two years into his ten-year sentence. Was he given medical leave due to his deteriorating health? Although I'll need to find an obituary or other newspaper account of Maddigan's final days to properly conclude this story, this new evidence provides some closure for a sad chapter in both men's lives. Maybe he appealed the conviction? That's a possibility I hadn't considered, Amy. 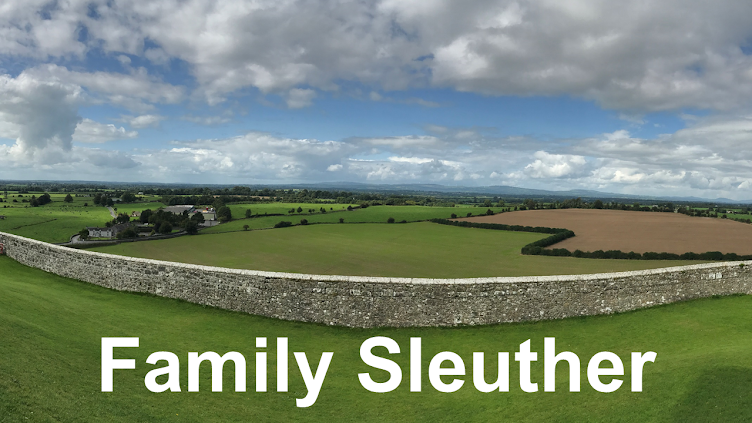 Whatever happened, I'm hopeful to find something documented to confirm the circumstances.